Attention all Pubcon Las Vegas attendees – get your cameras ready! Pubcon Las Vegas is almost here, and the ninjas attending are getting pumped up. As always, it promises a week full of great sessions, fun networking events, and the excitement of the Las Vegas Strip. To make this Pubcon extra special, we’re holding a contest for everyone attending. 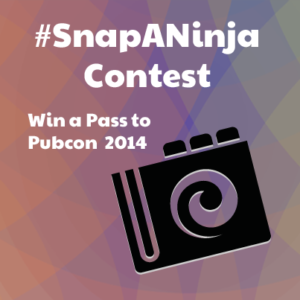 All you have to do is “Snap a Ninja” for your chance to win a pass to Pubcon in 2014 and $500! Contest starts October 20, 2013 and will go until October 25, 2013 at 11:59am ET. You must be following us on Twitter to win (which you really should be doing anyway!). Simple, right? You may enter as many times as you want, as long as each picture is an original. At the end of the conference we’ll randomly choose one winner to win a pass to Pubcon in 2014, plus a $500 American Express gift card. See full rules and eligibility requirements here. So come visit us at booth #36, catch one of our ninjas’ sessions, or say hi if you see us out and about! @SarahMayhem @ninjasmarketing will be looking for you Sarah. RT @jimboykin: #SnapANinja at #Pubcon Las Vegas for a chance to win! http://t.co/ekQBy75mVm < Fun idea!